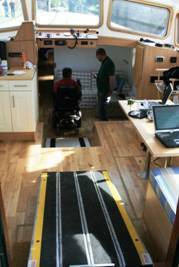 There were lots of books and websites offering all kinds of advice on the general accessibility (or otherwise) in the cities and towns of the countries we planned to visit on a barge. 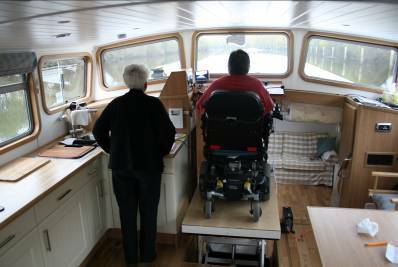 But little on designing a wheelchair-friendly barge to live on and skipper, or on the feasibility and practicalities of getting ashore along the European inland waterways for those of us with a physical disability; the information essential to folk who dream of living and travelling long-term on a barge using wheelchairs, mobility scooters or who are starting to find steep steps and narrow gangplanks a growing challenge. This webpage is a summary of what we have learnt so far. I will keep adding to it as we go along and I’m keen to include others contributions so it’s as comprehensive as possible. 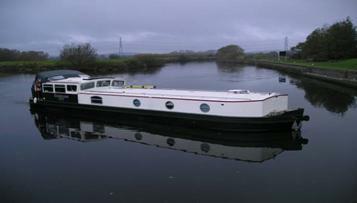 Barge Design; the starting point. 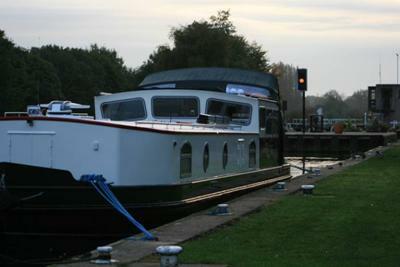 Our barge “Endellion” was designed for me a wheelchair, user to live on long-term, skipper and easily get on and off. 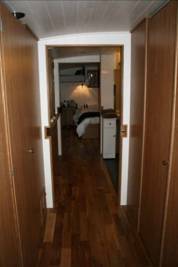 The living areas have many of the features usually seen in truly accessible homes – tables at wheelchair-friendly heights, a wheel-in shower, strategically placed grab rails, a vanity basin I can get to, sliding doors between cabins and the like. The precise measurements used were based on the Australian Access Standards as well as our personal experiences modifying and living in other houses and apartments. Skippering Endellion from the raised scissor lifter. 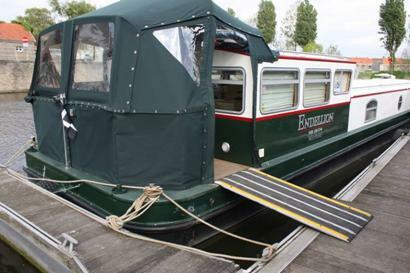 Like most barges, “Endellion” had to have several floor levels; a mobility challenge we dealt with by installing an electro-hydraulic lifting platform - a scissor lifter. 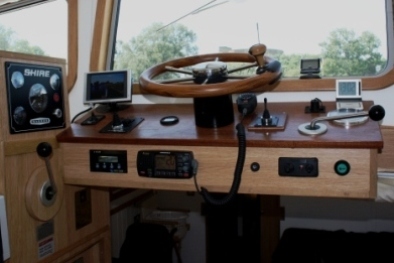 The platform lowers me from the wheelhouse-galley down to the saloon level or up higher to skipper. 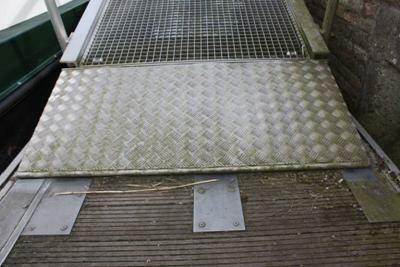 A custom designed hinged ramp fitted to the platform is also a safety barrier. 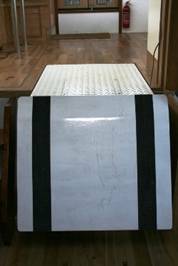 I use a portable 2 metre ramp to get up to the stern deck. 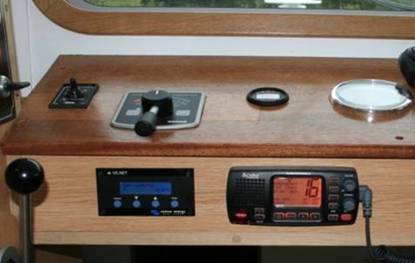 Vetus follow-up steering – it was great when it worked. The manual steering wheel and joystick (left below LCD screen) now installed. As I need to steer seated in my wheelchair, a traditional vertically mounted wheel wasn’t practical. We initially used only a computer based Vetus electro-hydraulic “Follow-Up” steering system. Unfortunately in our first 200 hours proved to be unreliable, suddenly failing at critical times. We have added a horizontally mounted manual wheel as back-up and replaced the Follow-Up steering with a simpler joystick – no more problems! As comfortable sitting down all day at the wheel may be, there are disadvantages. 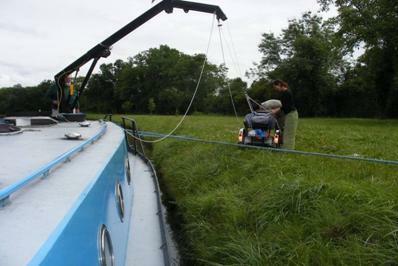 It’s not possible for example, to quickly move over to the sides to check you are well lined up to enter a lock or to squeeze through a narrow bridge arch. Sitting in a wheelchair, I’m also not able to quickly turn round to look behind. Is a barge is approaching? Have we have cleared the rear lock gates? 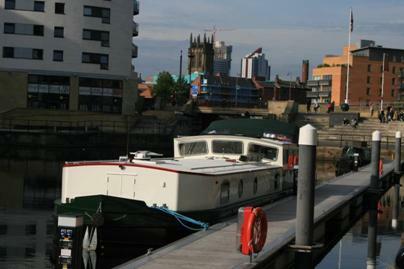 Or how are we going backing into that marina berth? 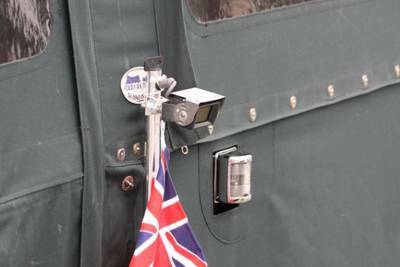 The solution has been to fit vehicle two reversing cameras; one on the bow and another on the stern. I can monitor either camera via a toggle switch on a small LCD screen mounted on the dash board. 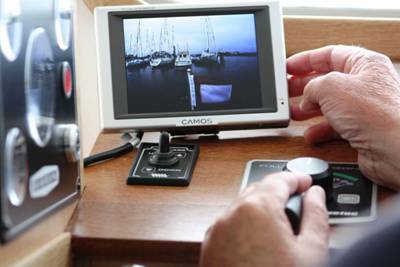 As both cameras have wide-angle lenses – 140 degrees, they are best when in close proximity to objects – lock gates, pontoons etc. 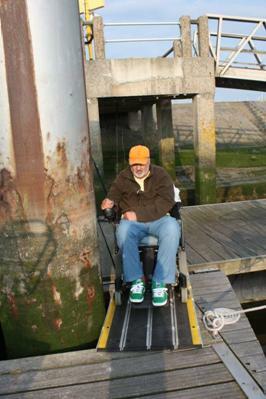 The final critical design element was egress; ensuring “Endellion” was built to enable people who use wheelchairs, mobility scooters or who have difficulties walking in general to easily get on and off a boat. These are the key features. 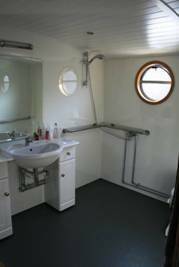 There are no bulwarks or raised gunwales around her square-cornered stern deck. 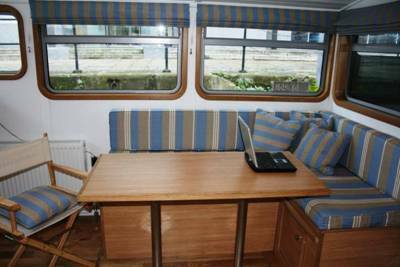 Gaps and removable sections in the handrails allow embarkation from either side as well as from the rear – handy when backed into a birth on a marina. 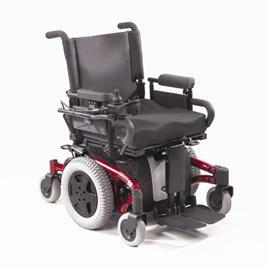 I use a very stable and manoeuvrable TDX-SR power wheelchair. The 6 wheels mean it doesn’t tip on steeper slopes and smoothly handles obstructions of up to 3 inches. The chair’s centrally located wheels means turns up to 360 degrees in its own length – a great advantage on narrow pontoons. To make sure the ramps aren’t too steep when rolling off onto narrow pontoons, we sometimes need to use fenders and ropes to keep the barge out from the shore. 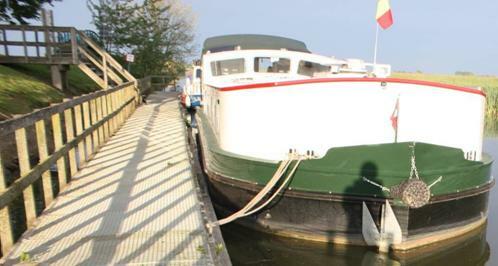 Our strategies, we are sure, are not the only ways to successfully conquer the challenges of waterways access on a barge. John Wheatcroft kindly sent pictures of the crane mounted on their barge “Final Fling” used to lift a mobility scooter onto the shore in France. Here are a few pictures of the scooter unloading that give a selection of bank types. I am sure that with a bit of care in selecting your mooring sites you will be able to get ashore at least in 50% of occasions. 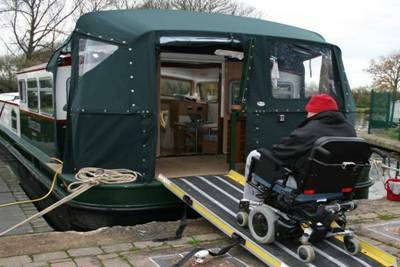 English inland waterways were generally remarkably accessible for people with physical disabilities. Canal banks and pontoon heights were mostly no more than a couple of hundred millimetres above or below our stern deck height of 600mm, so I was able to disembark relatively easily. 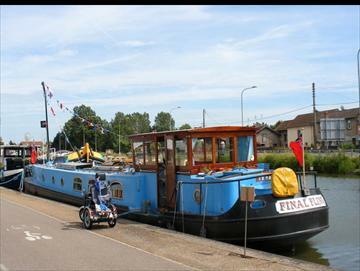 Occasionally pontoons and canal banks are at heights which mean I could drive straight off the barge without using a ramp. 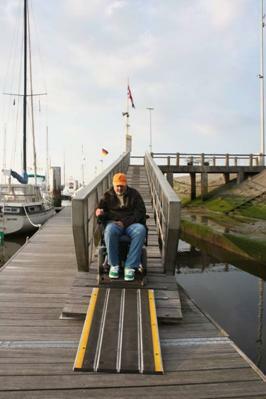 Importantly, pontoons were connected to the shore by gently sloping ramps like this, fitted with metal flaps top and bottom which make a huge difference for wheelchair users or people pushing trolleys. 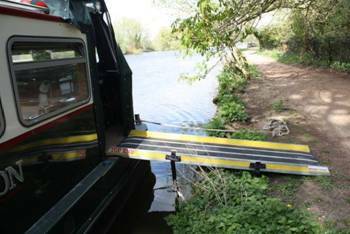 Accessibility was much the same along the non-tidal Thames, administered by the Environment Agency, though there were challenges in a few locations where the pontoons or banks were just too high. There were some remarkable happy surprises along the way too. 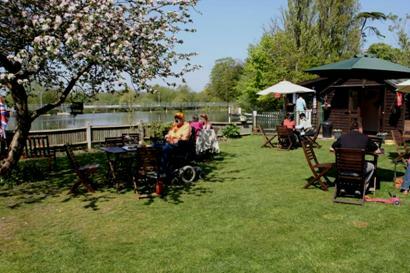 At Sonning, for example, the lock-keeper’s wife sells tea, sandwiches and wonderful home-made cakes on an island over the lock. 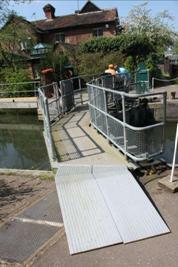 Ramps are on hand to assist wheelchair users to cross over the lock gates. It doesn’t get much better than that! A summary of where I was able to successfully get on and off in England. 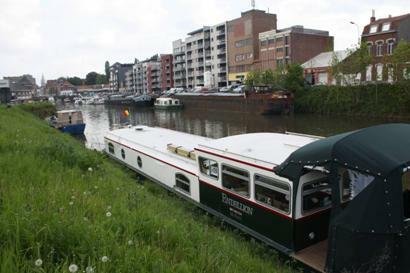 In Flanders in the south-west , canal banks also serve as levees or dikes to keep water out as well as in and were often very high – two metres or more above water level. We haven’t been able to just stop anywhere we like, put down a ramp and go ashore. Yacht Haven quay sides have been even higher and the vast tidal marina at Nieuwpoort – home to over 2,000 yachts, presented other “interesting” challenges (while we waited there for some work to be done on “Endellion”) because of the huge rise and fall of the tide. Ramps which were fine at high tide were impossibly steep when the tide was low. It was very important to carefully study the tide table before venturing out around town for the day! 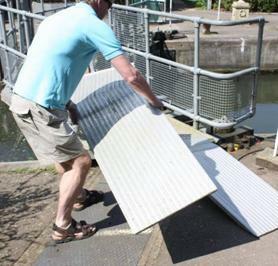 Pontoons on commercial marinas are not really designed with wheelchair access in mind. 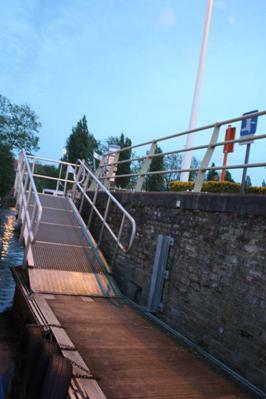 While we have come across many places in Flanders with pontoons placed at water level, frustratingly many of these have steps connecting to the shore. Hearing there was an excellent restaurant in the tiny hamlet of Fintele, we moored up on a sturdy pontoon. But steps led up to the top of the levee and down to the front door. Impossible for wheelchairs. Their take-away fish dish however, was excellent! There are some notable exceptions to be found in Flanders. 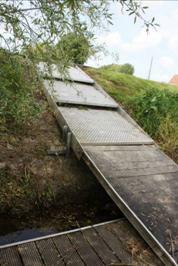 This ramp at Veurne was a little steep. With care, it did the trick. 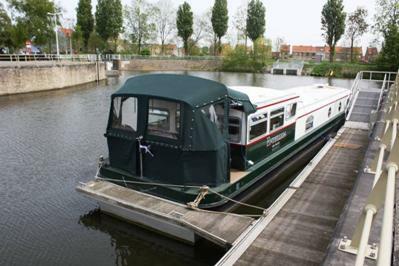 Extraordinarily friendly Belgian lock- keepers and yacht-haven managers often go out of their way to try to make up for some lack of consideration for access issues. 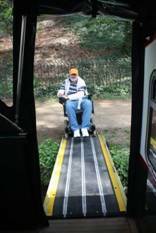 We are very optimistic accessibility will improve as we journey on through Belgium and beyond. 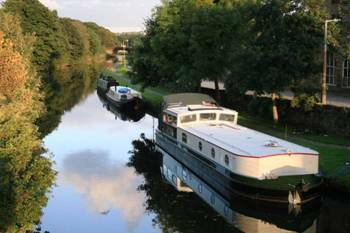 Like for everyone else on the waterways, it’s very much a matter of asking the right questions of the right people, studying the guides and keeping an eye open for suitable spots. All round, its only adding to the thrill of the challenge which is making barge life such a rewarding adventure for us both.